In the late summer of 2012, a friend sent me a website she was working on. "Would you mind checking out the links and seeing if they work?". Taking a break from my regular day, I perused the site, clicked on links, and ended up on the 'Volunteering' page. 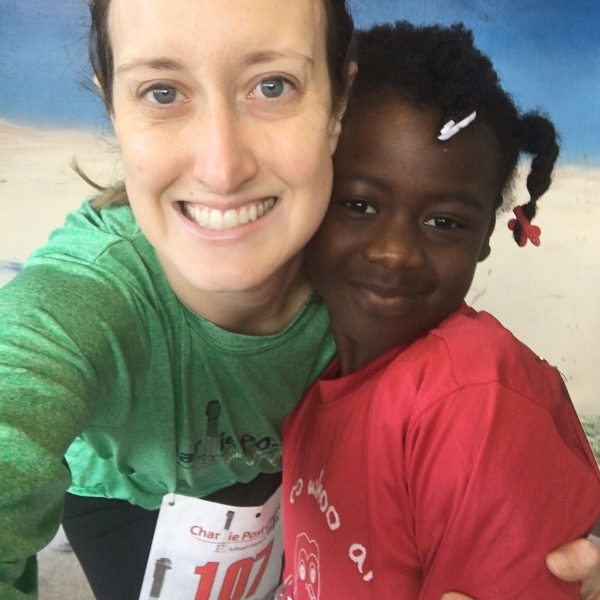 In my years working full-time for a non-profit in the Lowcountry, I had yet to find my own personal volunteering niche outside of the paid days. Before my move to Charleston, from my hometown of Bristol, VA/TN, I had been active on the YWCA Junior Board and the Birthplace of Country Music Alliance Board (which is doing big things today!). Shortly after clicking on the 'Volunteering' page, I had filled out a mentor application, sent it in, and was contacted immediately about connecting with a student. That fall, I met Ashlyn. Mentoring for the first time is pretty much how you'd imagine it to be. It's like your first day of school, only you're an adult and nervous to meet a kindergartner. Will she think I'm cool? Will we connect? What will we talk about? And yes, even our connection, as strong as it is now, took time. We started off coloring a lunch bag that I still bring every week after four years together. Sometimes, I'd bring my Kindle and she'd play a game on it. After time, though, our time together was effortless. Catching up on what we'd done in the past week, what was coming up, and a few bouts on the playground. Today, we still have lunch together once a week, but a couple of years ago, we started running 5K's together and this year, she started playing lacrosse games that I attend. Her school, Meeting Street Academy, always has some great extra events to attend, as well. Week before last, we were sweating it out at a kickball game over lunch. Mentoring in the Lowcountry is a popular volunteer option, as it fits well into schedules of most 9-to-5ers and weekend/evening warriors. The non-profit, Be A Mentor, oversees most of the mentoring programs and provides resources to volunteers throughout the year, as well as social hours and a mentor appreciation dinner every year. In my three years attending the Be A Mentor dinner, they've always featured a strong mentor/mentee team to speak at the dinner. This year, Ashlyn and I were picked to present. We prepared by having a BAM staff member come to our regularly scheduled lunch to throw some practice questions our way. Ashlyn, ever the performer, answered the questions with ease and was ready for our time in front of the crowd. We were so excited to present that evening. She had me beaming the entire time (photographic evidence) and even caught me off guard for a moment, when she mentioned to the entire dinner that her favorite memory from our time together was when I told her I was having a baby. Well, that's one way to break the news! As Ashlyn and I prepare for another summer apart, and letter writing ahead, I reflect on this past year of her growth- our growth as friends. Fourth grade is coming in fast, but like I told her under my breath at the dinner, we'll be friends for decades to come. My wish for her, as I'm sure is the same for many mentors, is that I impact her life in a strong, positive way. That the years ahead might not be so difficult as a teen because she has me to talk to about the trials. That her multiplication tables were a little easier because I sympathized with the fact that 3's were hard for me, too. That being a strong, smart woman is a positive attribute and not something she should shy away from. What volunteer activities do you enjoy? We're looking for a community group project for the Studio team to take part in, so leave your ideas below! The Lowcountry is known for it's scenic views, history, food, and more, but do you know about it's propensity to give back? Today, Janeen Vosseller and Frances Deschenes talk to us about how joining a civic organization changed their lives for the better and how you can get involved in helping your own community- all while making new friends. As a College of Charleston student, turned full-time Lowcountry resident, my closest friends here were from my college days. However, after graduation those close friends one by one all moved throughout the country for amazing, new opportunities. I remained in the Lowcountry with the perfect job and a wonderful boyfriend, but no particularly, close friends. I decided to turn to a civic organization to help me get out there and make new friends. The Lowcountry offers a plethora of activities and clubs that anyone can participate in, but with a heavy work load six months out of the year and not liking any activity that involves a ball or frisbee being thrown at me, which to join? I sought out my mom for advice and she suggested what she did at my age: the Junior Woman’s Club. I decided, "Why not?". At the very least, I'd end up volunteering for a few charities that support our community. Luckily for me, I knew someone who was in the club already, so I reached out to her about information on Charleston’s chapter. The response back was nothing but praise and encouragement to join. From my first volunteer event, I knew I had made the right decision. This club is made up of ladies who want to help their community become a better place, while opening up a window to meeting new people. The members are a wonderful representation of Charleston; women who are from Charleston and out-of-state, work in all different industries from health to education to business, and in all different stages of life. Everyone is ready to welcome you to the club and treat you like a friend. Bonds are made quickly in the club, while you are getting your hands dirty and stepping outside your comfort zone at volunteer events. The social events where we catch up are just the cherry on top of it all. The Junior Woman’s Club is a wonderful club where life-long bonds are forged while making the Lowcountry community a better place. Janeen is an audit associate at Johnson Lambert, LLP in downtown Charleston. She is originally from Cranford, NJ, but now resides in Mt. Pleasant where she enjoys exploring the local parks with her dog Dori and grilling out with her boyfriend, Michael. For the past five years of living in the Lowcountry, I have seen it receive many accolades; from the top travel destination in the world to friendliest city in the U.S. There is one other title the Lowcountry deserves to be acknowledged for, and that is being the most GIVING. Maybe I never noticed it until the summer of last year, but the people of Charleston come from a giving culture. Last year, I needed a change. I had a sports injury involving my ACL and couldn't participate in the athletic and active things that I had grown accustomed to doing here in the Lowcountry. Luckily for me, a last minute invite to a charity event opened my eyes to a group of women that I would not ever be able to replace. I joined the Charleston Junior Women’s Club after only meeting 2 members. Their willingness to give back to their community and amazing personalities led me to attend a member meeting at the Main Library, a decision that I am glad I made. In that year, I have seen these amazing women volunteer at Lowcountry Orphan Relief, Race for a Cure, Florence Crittenton Programs of SC, and multiple occasions for the PlayToday Foundation. Although the main focus of the group is to give back to the community, they also know how to have a good time and bring the best out of everyone they interact with. Through social events on the Palmetto Breeze, to happy hour at Taco Boy, and the occasional Cypress burger night after our monthly meeting, these women truly invest in each other and the community. I loved being a part of this group so much that I encouraged two other close friends to join with me. I have grown and changed for the better thanks to these ladies and am excited to go into this new club year as a board member. Frances is a Corporate Sales Manager at the DoubleTree Charleston Airport. Originally from Charlotte, NC, she has lived in Charleston for 5 years. She can be found Sunday's during the fall cheering on her beloved Carolina Panthers with friends. The Charleston Junior Woman's Club (CJWC) is a civic, nonprofit organization, founded in 1966. All members of CJWC are united by dedication to community improvement through volunteerism. The CJWC leadership stresses community involvement among its members, who in turn donate their time and talent to numerous organizations. If you are interested in learning more about becoming a member of the Charleston Junior Women's Club, visit the membership page or email info@cjwc.org.